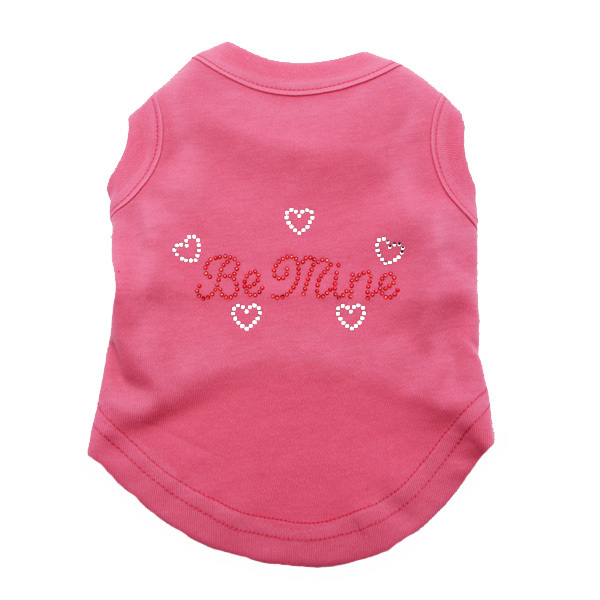 Make sure your furry Valentine is sending the right message with this cute dog tank in eye-catching Bright Pink! Cotton blend dog tank top. 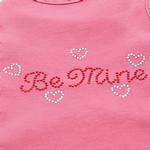 "Be Mine" writing and hearts in rhinestones on a bright pink shirt. Perfect for Valentine's Day celebrations! Who doesn't like to be asked to be one's Valentine!? 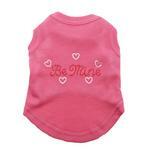 This Be Mine Rhinestone Dog Tank in Bright Pink is a perfect way for your little Valentine to share some love! This simple cotton blend tank has "Be Mine" printed in ruby-colored rhinestones in a sweet font. The sentiment is framed by silver rhinestone hearts for even more shine! This comfortable pullover style tank is ideal, of course, for Valentine's Day, but your pup will enjoy wearing it year round. With its sleeveless style, rounded and nonbinding hem, and high-cut, stay-dry belly, this practical style is great on its own or layered under jackets. Care: Machine wash, inside out on a gentle cycle to protect the heat transfer rhinestones. Tumble dry low or lay flat to dry. Mirage tank tops run smaller than some of our brands, so be sure to double check those measurements when ordering! 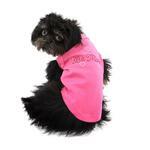 Be Mine Rhinestone Dog Tank - Bright Pink Customer Photos - Send us your photo! Don't I look cute? I just wish mommy would stop taking my picture. But I do love my new clothes from Baxterboo for the dog park visits. Lilo loves her "Be Mine" shirt! It's as cute and sweet as she is! Miss Maisy is modeling her Be Mine Rhinestone Tanks and Valentine Hearts Bandanna. She loves her new plush hearts bone and says thank you. Posted On 04/10/19 by Karen L from Dearborn, MI Yes, Karen L recommends this product! The 3XL fits my 55 lb, 18” N, 26” C, 22” L Am Staff mix very well. Layered under sweatshirt this winter (very cold dog) and no loss of rhinestones. A Cute V-Day tee - Stats: 55 lb, 22” L, 26” C, 18” N Am Staf pit bull mix. 3X little tight going on, but seems able to stretch. So far, very good. Posted On 02/08/17 by Cecelia D from Woodstock, GA Yes, Cecelia D recommends this product! Looks adorable on my little rat terrier. Posted On 12/07/15 by Amaya M from , Yes, Amaya M recommends this product! It's a high quality shirt and it looks adorable. Posted On 10/18/15 by Sandra G from Central FL, FL Yes, Sandra G recommends this product! I don't wait till the season. When I see a good buy on a darling outfit, I buy it for my little Morkie. Everyone thinks Daisy is dressed to the "nines", and I tell them - I LOVE BAXTERBOO!!! Posted On 08/28/15 by Anita W from Miami Lakes, FL Yes, Anita W recommends this product! Looks great! Runs a little small. Bought 3 . My two pugs and kept the too small one for a future puppy! Super Cute for Valentine Day! Posted On 01/28/15 by Carolyn D from Houston, TX Yes, Carolyn D recommends this product! Love these pink shirts. My Pugs will be so cute! Everyone needs to know that I think these shirts might run small. I ordered up a size and I sure am glad I did. Posted On 01/03/15 by sherry m from , Yes, sherry m recommends this product! cute little shirt for valentines day. fits perfectly. Posted On 11/08/13 by Kimberly S. from Roaring Brook TWP, PA Yes, Kimberly S. recommends this product! It is so hard to find anything really cute and of high quality when looking for anything with hearts in the design. And the sizing is accurate and even after washing it didn't shrink. Thanks for carrying this item! Great product! Delivery was quick and quality was great!